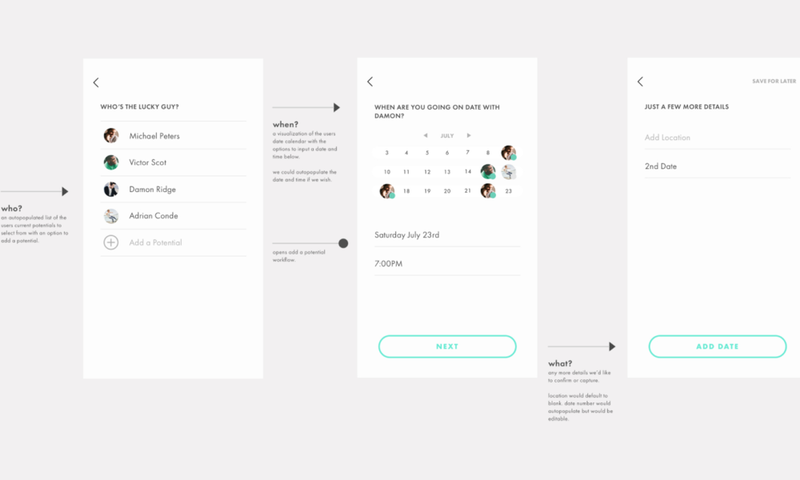 the founder of evolve came to us with a concept for an app that would help people learn about their own dating patterns so they could make smarter decisions that led to more meaningful relationships. Together we set out to turn his vision into an intuitive, delightful technology. We kicked things off with an in-depth user research study that would inform product strategy, core features and use cases for the app. We conducted interviews with hopeful romantics across the country, learning about their dating experiences, behaviors and goals. We hosted a half-day Brand Discovery Workshop filled with creative exercises designed to unite the founding team around a mission, vision and core values they could stand on. The workshop left us feeling inspired and aligned around the construction of a Brand Book that brought Evolve’s bold identity to life. with the prototype in hand, we dove into evolve's beta design, soliciting feedback from a series of initial user tests to prioritize product features and confirm the brand direction. Ultimately, We delivered an app store ready, mobile application along with a growth toolkit that allowed the Evolve team to masterfully execute a Boston based beta. Within a year, Evolve was acquired by Hubspot.